Repeat Exercise 3.16 using analytical techniques, but reverse the order of the two legs of the walk and show that you get the same final result. (This problem shows that adding them in reverse order gives the same result—that is, B + A = A + B.) Discuss how taking another path to reach the same point might help to overcome an obstacle blocking your other path. Figure 3.60: The two displacements A and B add to give a total displacement R.
Video error: The video says "North of West" (N of W), but the components were substituted into the inverse tangent function unintentionally as "x-component divided by y-component". This results in the angle being to the West of North. The angle is between the resultant vector and the y-axis. This is College Physics Answers with Shaun Dychko. In exercise 16, we had this picture for using the graphical method for finding the resultant of the walk. 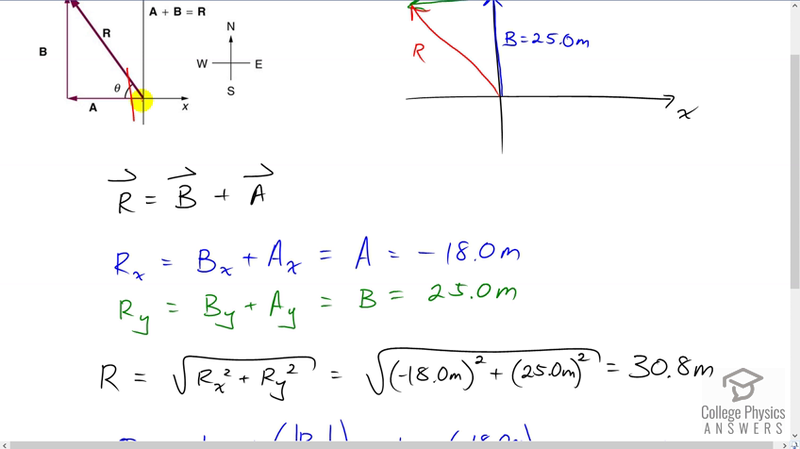 Now in this problem we're going to use analytical techniques and do, use trigonometry and so on, with the change being that we're going to add vector B first and then vector A. So whereas in problem 16 the path first went along part A and then along part B, we're now going to start with vector B and then go along A and we'll confirm that we end up at the same place, so the resultant will be the same. So the x component of the resultant will be the x component of the B vector plus the x component of the A vector. The B vector has no x component since it is vertical and so, the A vector is entirely in the x direction and so, the x component of the resultant is the A vector. That's negative18.0 meters, negative because A is directed left. The y component of the resultant is the y component of the B vector plus the y component of the A vector, the A vector having no y component leaves us with only the B vector which is entirely in the y direction and it's upwards and so it's positive. That's positive 25.0 meters. Now the magnitude of the resultant is the square root of the sum of the squares of its components and so that's the square root of negative 18 meters squared plus 25 meters squared giving 30.8 meters and its direction is the inverse tangent of the size of its y component, divided by the size of its x component. I say size of because I'm referring to these absolute value signs here which means ignore the negative sign if there is one. We'll get our direction by looking at our picture and we'll see that since we're taking the inverse tangent of the y component, divided by the x component, that means we're going to get the angle in here and so our answer will be to the north of west. So we have the inverse tangent of 18.0 meters over 25.0 meters, giving 35.8 degrees north of west. So our resultant is 30.8 meters, 35.8 degrees north of west. What we can see is that if there is an obstacle in the path here, some big rock that you want to avoid, you can get to the same place by taking a different route which is kind of obvious, but now we just sort of demonstrated that that's true using analytical techniques. Thanks a lot for pointing this out happyfeet1025. I've flagged this video for a re-take and put a note in the final answer section. I mistakenly substituted the x-component divided by y-component, which results in the angle being to the West of North. The angle is between the resultant vector and the y-axis.